Is it tiny or is it far away? As many of you know, Mr. Wilson’s started life as a strolling street theatre performance, with a very clear ambition of inciting mini raves in public spaces for everyone and anyone who would listen and dance to us. It’s definitely what we do best, we’ve worked really hard since 2013 to nail this and we love it. There is nothing better than having audiences right up close, jumping and sweating and smiling, shoulder to shoulder with us. Over the last year, however, we’ve been invited to perform to much larger scale audiences, most recently Milton Keynes 50th Anniversary celebrations, MK50. 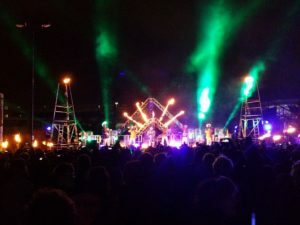 We worked along side our old friends at Walk the Plank to perform a spectacular fiery finale for huge audiences. In preparation for this and future performances of this scale, we’ve begun to interrogate how best to use the performance skills we have so that our content reads and can be experienced by 3-4 thousand people at a time without loosing that kinetic and immediate street charm. We want to showcase and feature our soloist, use space, movement and timing to enhance our music and act as a conduit for the audience experience of live rave music. It’s interesting to see which performance skills are relevant across every scale and which are particular or polarised to intimate or spectacle shows. We’ve been also building our movement vocabulary exploring physical qualities, space and increasing the range in our bodies. In theory this should see us developing movement shorthand to work from so we can adapt to new stages in the future. In reality it means a lot of bopping around our cold rehearsal space, stretching, tripping over our own and each others feet and hard graft keeping us fit and busy over the winter. Here’s a film of MK50’s celebrations – it was flipping massive! Well done Walk the Plank for weathering Storm Brian to deliver this beauty.